Family photographs featured in a new exhibition at Rugby Art Gallery and Museum reveal a fascinating snapshot of the town's social history. The Eadons Of Hillmorton Road features photographs which capture everyday family life in Edwardian Rugby. The collection of more than 300 glass plate negatives, dating from 1910 to 1918, was donated to the Museum a decade ago by David Eadon. The majority of the photographs were taken by David's father, Edgar Christie Eadon, known as Chris, with others believed to have been taken by Chris's father, William, who was a reporter for the Rugby Advertiser before becoming secretary to a succession of headmasters at Rugby School. In addition to snapshots taken at the family home in Hillmorton Road, the exhibition features a photograph of both Chris and his brother, Leslie, in Lawrence Sheriff School uniform, and photos of Foster & Dicksee Builders of Rugby, located in James Street, where Chris started his working life. The Eadons Of Hillmorton Road also includes a photograph of the celebrations following the election of John Baird as MP for Rugby in 1910, and snaps taken on the family's annual summer holiday in Llandudno, where Chris met his first wife, Gwendoline. When I was a youngster, I can remember my father taking photos. He always took a camera whenever we went on trips and holidays. When my mother died I found the glass plate negatives in a wooden chest in the garage. I brought the chest home and started to look through the negatives, and took five to a photography shop in Rugby to be printed. Then a member of staff at Rugby Art Gallery and Museum mentioned it had the equipment to process the negatives, and all the photographs were scanned in and transferred to disc. 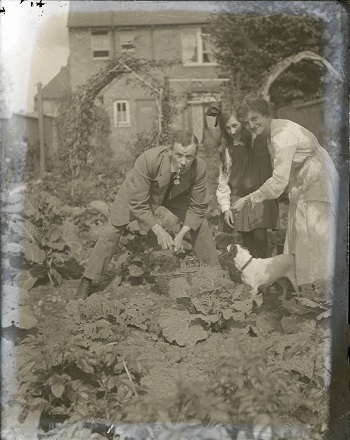 The majority of photographs we have from the Edwardian period were taken in a formal studio setting, so the Eadon photographs offer a unique insight into normal family life. At the time, the development of dry plate processes revolutionised photography and led to a surge in people taking photographs as a hobby. The Eadons Of Hillmorton Road runs at Rugby Art Gallery and Museum's Social History Gallery from 18 September to 12 January. Thanks to donations from residents, the Museum's social history collection has a wealth of photographs, documents and objects which tell many stories of Rugby's past. The collection of Eadon family photographs reveal everyday family life in the town both before and during the First World War, and we're delighted Mr Eadon's donation has allowed us to put the photos on display.